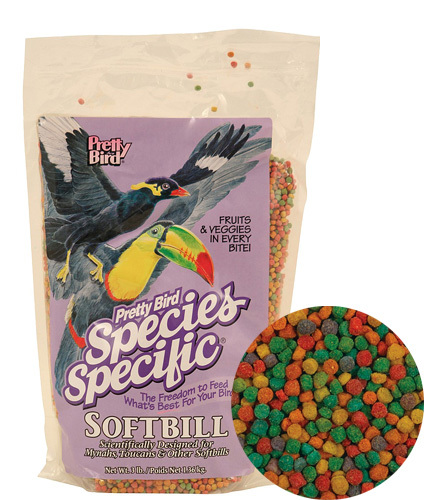 Simplifies the feeding and management of softbill birds such as mynahs and toucans. Manufactured with fructose which is a naturally occurring ingredient in fruit in a smaller shaped nugget. Our iron levels are less than 60 Ppm, which is well below the safe maximum levels currently recommended. Softbills love fruit which should be offered on a daily basis. 18% protein and 8% fat. INGREDIENTS: Corn, Potato Protein, Wheat, Oats, Soya Oil, Coconut Oil, Corn Gluten Meal, Fructose, Raisins, Coconut, Papaya, Apricot, Banana, Sweet Potato, Pineapple, Apple, Spinach, Broccoli, Carrots, Dates, Calcium Carbonate, Dicalcium Phosphate, L-Lysine, Choline Chloride, Natural and Artificial Flavors, DL Methionine, Isoleucine, L-Threonine, L-Tryptophan, Vitamin E Supplement, Ascorbic Acid (Vitamin C), Ferrous Sulfate, D-Biotin, Yucca Schidigera Extract, Zinc Oxide, Manganous Oxide, Niacinamide, Vitamin B12 Supplement, BHT ( as a preservative), Copper Sulfate, Calcium Iodate, Beta Carotene, Vitamin A Supplement, Calcium Pantothenate, Sodium Selenite, Folic Acid, Riboflavin, Pyridoxine Hydrochloride, Thiamine Mononitrate, Natural and Artificial Colors, Menadione Dimethylpyrimidinol Bisulfite (source of Vitamin K3), Vitamin D3 Supplement, Cobalt Sulfate. Guaranteed Analysis: Crude Protein (min) 18%, Crude Fat/Oil (min) 8 %, Crude Fiber (max) 3 %, Moisture (max) 10 %, Ash (max) 4 %, Vitamin A (min) 22,000 IU/kg, Vitamin D3 (min) 700 IU/kg, Vitamin E (min) 200 IU/kg, Copper (min) 14 mg/kg.